Stay up-to-date on Benajmin's latest news and media appearances. It was a long day, but a good one. My family had finished dinner and I was cleaning the dishes. As I washed off the last cup, I felt a gentle tap on my hip. I looked down to see my daughter’s innocent brown eyes staring up at me. With 15 years of experience with the NFL, Saints tight end Benjamin Watson is a veteran player who takes his leadership job seriously. A Saint from 2013 to 2015, he returns to the team after spending two years with the Baltimore Ravens, and is ready to hit the ground running. President Trump recently made an offer to National Football League players like us who are committed to protesting injustice. New Orleans Saints tight end and the 'Players Coalition' member joins 'The Ingraham Angle' to discuss the NFL's $90 million donation. With a healthy blend of humor and authenticity from New Orleans Saints tight end Ben Watson, Liberty University students were encouraged in Friday’s Convocation to bridge the divides in our culture, racial and otherwise, for the sake of unity and the Gospel. New Orleans Saints Tight End Benjamin Watson was voted one of CNN's Extraordinary People of 2014. Benjamin Watson and his wife Kirsten find a local partner that works with families in need. Every Christmas they bless parents with the gospel message and a time for fun, connecting with other families, and going on a shopping spree. Benjamin Watson discusses the proper way for Americans to deal with racism. He advocates that people need to be open to having a conversation, as well as looking at other people's viewpoints. 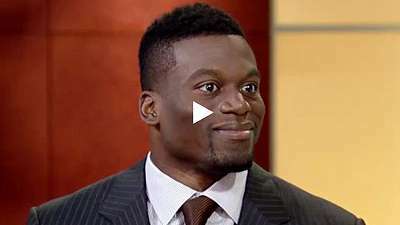 Benjamin Watson was on the set of Fox News to discuss his book.